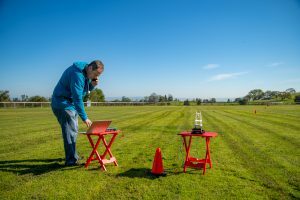 SLAC National Accelerator Laboratory scientists have developed a new pocket size antenna for applications demanding high mobility. According to the scientists, the 4-inch-tall antenna enables mobile communication in situations where conventional radios don’t work. It could be especially beneficial for transmitters that work under water, through the ground, and over very long distances through air. The SLAC device emits very low frequency (VLF) radiation with wavelengths of tens to hundreds of miles. These waves travel long distances beyond the horizon and can penetrate environments that would block radio waves with shorter wavelengths. While powerful VLF tech require gigantic emitters, the SLAC antenna is more simple in nature and could potentially be used for tasks that demand high mobility, including rescue and defense missions. “Our device is also hundreds of times more efficient and can transmit data faster than previous devices of comparable size,” said SLAC’s Mark Kemp, the project’s principal investigator.